Expect great, good-​​value food in the local restaurants, sometimes (but not usually) with no menu, in relatively homely surroundings. 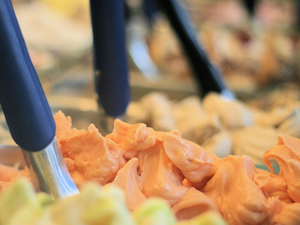 Some restaurants will bring a mouth­wa­tering array of antipasti unless you stop them. Restaurants start serving dinner at around seven but are at their busiest at about 9.30pm. Don’t be surprised to find the locals watching the football at Da Felllicino (the triple ‘l’ is intentional), aka Billy’s (with just the double ‘l’). Most restaurants in Capena are best for evening meals. A cheap lunch option for a great choice of top quality dishes is to go to the self-service restaurant in L’Arca shopping mall. 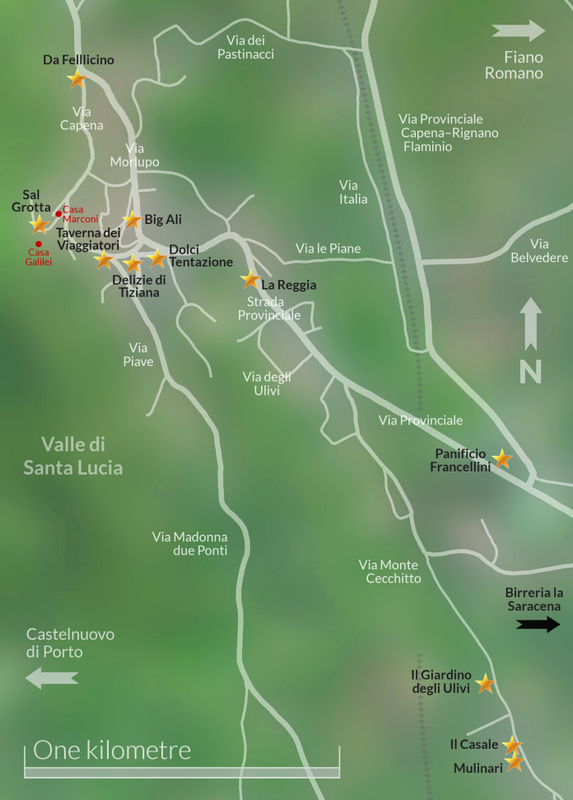 Drive out of Capena on the Via Provinciale, follow the road for about 3 km until you get to a T-junction and then turn right. Look for the big entrance to L’Arca on your left after about 200 metres. Another lunch option, combined with culture, is to visit Art Forum Wűrth, where visitors are entitled to enter the exhibition free of charge and eat in the staff canteen where prices start from €6 for a three-course meal. There are also three shops in Capena that serve take-​​away pizza slices and other excellent fast food, Italian style. Currently the best one is Pizza e Sfizi in Via San Luca. Fork right at Antica Caffetteria (Bar Centrale) when walking up the hill and it is on your left. Here you can buy everything for a great meal at home at very low prices. All the restaurants serving pizza also offer a take-​​away service. Breakfast is a bargain at any of the bars in Capena, with a cappuccino and cornetto (Italian style croissant) usually costing about €1.70. 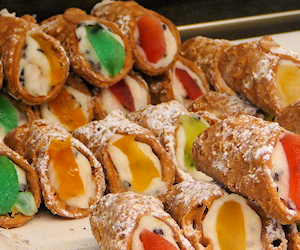 Capena currently has a little explosion of home-made ice-cream and cake shops and the temptation to sample them all is almost irresistible. Last but not least, Happy Hour is a new phenomenon in Capena. It doesn’t mean half-price drinks but an array of free antipasti set out to accompany your aperitivo. Usually available between 6.30 and 8.00 pm. This new taverna in town offers hearty Roman fare with a promise of a bill of no more than around €12 per person. It opened in May 2011 in place of the Anatra Grassa, which has gone on to bigger and better things in Rome, though still within striking distance of Capena, at Via Savoia 68. 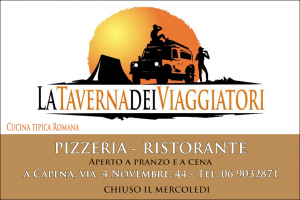 La Taverna dei Viaggiatori is good news for holiday-makers who would ideally like to eat out as much as possible but don’t want to pay top prices every night. Mirco, the ebullient owner, is an overland travel enthusiast (hence the Taverna’s logo and name). They also do pizza. The Taverna also has a lower terrace where you can linger over a beer and puff away to your heart’s content if you are a smoker (at least in summer). Undoubtedly the best value food in Capena if all you want is pizza or pasta. A lively, bustling atmosphere. Probably best to book a table or go early to beat the crowds. Serves a large pizza and pasta menu. Outside eating area in summer. A bit of a hike up the hill, but worth it when you get there: an excellent restaurant with a Sardinian flavour, specialising in fish and seafood dishes. The seafood antipasti are superb. Worth asking for a menu because the pricing can sometimes be a little erratic. Outside eating area in summer. A tiny ice-cream and cake shop on Via Don Minzoni selling home-made cakes in winter and home-made ice-cream in summer. The wall behind the counter is lined with the proprietor's framed diplomas in the art and science of making ice cream. An excellent value take-​​away that has become a firm favourite with our guests and is only a few minutes’ walk from the house. Dishes range from pizza to chicken and chips Italian style (which is as different as can be from KFC). Open until 8 pm. Phone 06 903 3049. Despite its modest external appearance, this is a delightful little café-​​bar, located at the south-east corner of the Piazza della Libertà. The owner of Le Delizie di Tiziana makes all his own cornetti, cakes and ice-​​​​cream, so this a pleasing place to visit at any time of day, and especially for breakfast. It’s by no means the nearest café to the Casa Capena properties but is certainly worth the stroll, and you may feel justified in scoffing two of those delicious cornetti when you arrive at your destination! Incid­entally, the bar’s name – ‘Tiziana’s Delights’ – is a reference to the owner’s amiable wife. This long-​​established and highly distinctive bar is located a short distance outside Capena on the Via della Mola Saracena. It had a Gothic theme last time we visited, but before that it was sort of Irish-​​Italian-​​American-​​Canadian. The ambience and decor are hard to beat (if you like that sort of thing) so it’s worth stopping by for a beer. 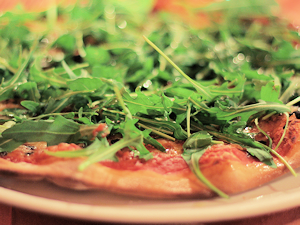 If you decide to stay and eat, a pizza is probably a better choice than a burger. On your right as you leave Capena down Via Provinciale. Probably only 10 to 15 minutes’ walk but you might prefer to drive as the main road has no pavement. An excellent restaurant with a really good value all-​​in seafood or meat menu. Also serves pizza. Although it is a five minute drive out of Capena, it is worth it for 5 star service and food. Giardino degli Ulivi costs a fraction more than the restaurants in the village but it is well worth the extra. The restaurant has a somewhat formal and tasteless interior but in summer you can eat outside on a lovely terrace. Another pizzeria with a very good reputation, located a short distance beyond Giardino degli Ulivi along the Via Monte Cecchitto. Follow the Via Provinciale all the way down out of Capena to the T junction where it meets the Tiberina (about 10 minutes). The Antica Fattoria is on your right with a big car park. Despite its location on the main road, the outside eating area is a pleasant spot where you can either watch your pizza being made inside or your meat being grilled on the outside barbecue. However, dining at this estab­lishment can be a bit of a hit-​​or-​​miss experience: the little touches aren’t always right and the staff aren’t always as friendly as one might hope. Unlike most places listed on this page, it's rather badly reviewed on Trip Advisor. Watch out for the sign a few hundred metres out of Capena on the right and follow the directions off the main road. Il Giardino di Sara also has an outdoor swimming pool and fitness centre.